Is Sciatica Caused By Infection? Sciatica or pain along the sciatic nerve is an important factor that causes chronic low back pain (cLBP). In Americans who are lower than 45 years of age, cLBP is the most common reason for disability. Every year approximately 3-4% of the US population is disabled temporarily and 1% of the working population has to stop working due to permanent and total disability. I have written a detailed article on sciatica, its causes and relation to back pain in my previous article. You can read it by clicking here. While there are quite a few causes of sciatica, what we are discussing in today’s post is about sciatica caused by infection. Yes, you read that right. 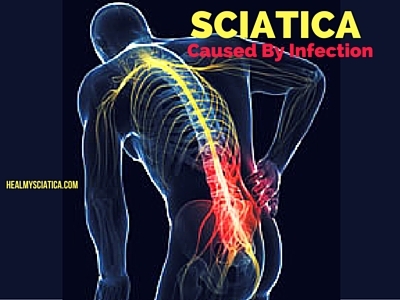 Sciatica can be caused by bacterial infection. Doctors have found out that in approximately 50 % of all sciatica cases, the sciatic pain is caused by infection. This is indeed a breakthrough finding as there is now a definitive cause to be pinpointed. The NHS in UK is spending a huge amount of money, more than 500 million British pounds annually to investigate and thereby find out an effective solution to help patients suffering from chronic back pain. Records suggest that chronic backache is indeed one of the toughest health issues in UK, which is lagging behind without a proper and effective solution. Around 16 million people suffer from at least one attack of back pain in any given year and a whopping majority of these back pain cases are confirmed to be sciatica related. Previously it was considered that sciatic nerve pain in sciatica was caused by an undue pressure on the sciatic nerve by a bulging or protruding intervertebral disc that is described commonly as slipped disc. Now the confirmation of sciatica pain caused by bacterial infection has changed the course of clinical management of sciatica. How Does Bacterial Infection Cause Sciatica? Well, the culprit that has been identified is known as the Propionibacterium acnes and this is a very common microbe that causes acne. Researchers claim that this bacterium could be introduced into the blood stream when there is a break in the skin as is the case when a pimple is squeezed. Once inside the blood stream, these little fellas target the spine and if they find any kind of damage or erosion of the intervertebral discs, then a low grade infection is set into motion and the patient now suffers from chronic back pain and sciatica. Well, the allopathic doctors who have come across this breakthrough are undeniably excited because they now plan to treat such cases with antibiotics. But the problem is that antibiotics leave a trail of suffering of their own and finally the patient is simply dealing with a new problem, without having an effective solution. The good news is that homeopathic medicine for sciatica caused by infection is not only devoid of any kind of side effects, but also provides a boost in the general immunity and vitality. So the patient who was suffering from chronic back pain and sciatic nerve pain is now fit and fine and healthier than before. Homeopathic treatment of sciatica caused by infection is based on personalization and individualization and every case is analyzed thoroughly before finalizing the prescription. The case analysis and study continues throughout the treatment process and fresh prescriptions are based on the response observed after the previous prescription. Get in touch with us now to enjoy a pain-free, healthy life! Please Contact me regarding this article. I have definitive information on where the bacteria is coming from. It is not from breaks in the skin. It is shocking but treatable. I know. I have cured it.